Wellington, Fla. - Dec. 5, 2018 - Founded by lifelong horsewoman Katherine Gallagher, E2 Show Jumpers focuses on sourcing, developing and selling talented young horses with proven bloodlines throughout Europe and North America. The team at E2 Show Jumpers is thrilled to welcome six horses from their European string to the United States, where they will continue their training under Wolfstone Stables' Schuyler Riley in Wellington, Florida. Recently, E2 Show Jumpers formed an exciting new sales partnership with Riley, a highly respected international show jumping athlete and one of the most successful riders in American history. The talented professional is looking forward to training, competing and representing E2 Show Jumpers horses for sale. The six horses from their European string who have arrived in the U.S. are Iceman de Muze, Quilimbo, Cazador LS, Karina, Arena Z and Little Beach. Iceman de Muze is a 10-year-old Belgian Warmblood stallion (Erco Van't Roosakker x Teekitiezzy de Muze) who currently competes at the grand prix level. His athleticism combined with his genuine character make him lovely to ride and a solid partner in the ring. Some of his recent highlights include numerous clear rounds and top-ten finishes with Dayro Arroyave in Belgium at the de Kraal International CSI3*, the Sentower Park CSI3* and the 1.45m level at Waregem Horse Week. In September, the pair executed a double-clear performance and another top-ten finish in the final grand prix at the FEI Zangersheide Sires of the World at the FEI/WBFSH World Breeding Jumping Championships for Young Horses. Quilimbo is a 9-year-old Holsteiner stallion (Quidam de Revel x Soda) who is also currently competing at the grand prix level with stellar results. While he was ridden by Dayro Arroyave, Quilimbo competed across Belgium and moved up to the 1.50m ranks at the de Kraal International. 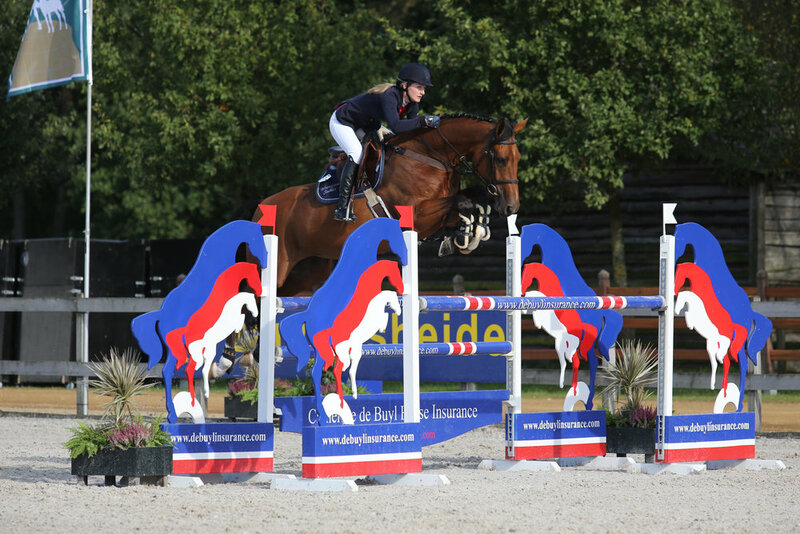 The duo had clear rounds at the FEI/WBFSH World Breeding Jumping Championships for Young Horses and won the 1.45m CSI3* at Zilveren Spoor. This horse has all the qualities and more that a competitive rider could want to achieve their goals in the ring. Cazador LS is a 10-year-old stallion (Casall La Silla x Takana LS) who has all the traits necessary to be a potential competitor in the U-25 classes. His lineage includes the famed Dollar Girl, who was ridden by Nick Skelton with much success. Cazador's royal bloodlines have shown through his performances. In 2017, he stepped up to the 1.40m division at the Costa del Sol Equestrian Tour in Mijas, Spain and most recently he produced clear and consistent rounds at the 1.35m CSI4* level throughout Europe. As a young horse, Cazador was extremely successful in the 7-Year-Old Young Jumpers at the Magna Racino Spring Tour in Vienna, Austria. Karina is a 10-year-old Irish mare (Argentinus x Contender) who is a lovely promising mount for the U-25 classes. Her unmatched talent, character and rideability make her a winning machine. In 2017, the bay mare successfully showed in the 1.40m division at the Costa del Sol Equestrian Tour in Mijas, Spain. Most recently, she had clear rounds at the 1.40m CSI4* level. Arena Z is an 11-year-old Zangersheide mare (Amoroso Van De Helle x Werena) who has all the characteristics of a true athlete and winner. This special horse is very easy and is ready to dominate in the Junior/Amateur Jumper ring. She moved up to the 1.40m Jumpers without a rail down during Magna Racino Spring Tour in Vienna, Austria. In 2017, Arena Z successfully campaigned in the 1.30m and 1.40m divisions at the Costa del Sol Equestrian Tour in Mijas, Spain. Little Beach is a 9-year-old Irish Sport Horse mare (Beach Ball x Elley's Next In Line) who is a winning Junior/Amateur Jumper mount. This horse is fast, brave, careful and fun to ride, which has led her to jump consistent rounds and earn top results all over. Her talent has been evident from the start of her career after she placed second at the 4-Year-Old Championships in Dublin, Ireland. In 2017, Little Beach achieved top ribbons during the Mediterranean Equestrian Tour in Spain. Most recently, she stepped up to the 1.35m height with Dayro Arroyave in Belgium. Katherine Gallagher is excited to watch these horses' training develop throughout the winter season in Wellington, Florida as they compete at the prestigious Winter Equestrian Festival (WEF) with Riley. For more information about these horses or to set up a trial, please contact Schuyler Riley at schuyler@wolfstonestables.com.